Creepy fun with freaky glow-in-the-dark effects! Bring to life all your favourite icky bugs and beasts. 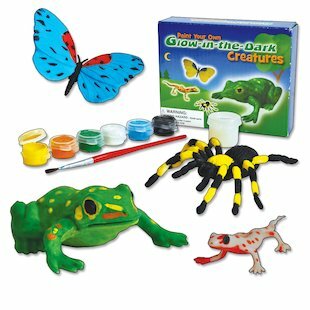 Paint a slimy frog, a spooky midnight moth, a squiggling spider and a fiery, fork-tongued salamander! Wait for midnight. Switch off the lights and watch them GLOW! Kit contains 4 glow-in-the-dark figures, display stand, 6 pots of paint, 1 pot of glaze, brush and instructions.